Have the toilets, plumbing fixtures, or drains been acting up at your property or a building that you are in charge of maintaining? If so it may mean that there is a predicament with the sewer pipes that are buried deep underground. Trenchless sewer repair in Enid, Oklahoma is a cutting edge plumbing procedure that avoids the disruption that is typically associated with excavating the pipes. Prior to the invention of trenchless methods plumbing companies were forced to dig up the entire area around and along the damaged sewer pipes. A great deal of sewer systems contain a pipeline that runs for hundreds of feet from the exit of the building to the main sewer line that is located under the street. This opens up the possibility that the contractor must dig a trench multiple feet deep and wide that runs along the entire length of the pipeline in order to physically expose the sewer pipes for repair. If you are curious as to what happens to your landscaping and hardscaping that is located within the area of the sewer pipeline it is destroyed in the process. In addition, the traditional trenching often forces property owners to pay to have the street dug up in front of the home or building. The property owner is financially responsible for any traffic that is re-routed, and for any necessary repairs to publicly owner property including the main sewer line. That is certainly an expensive headache that you do not want to deal with. It is bad enough that the every day functionality of the property is negatively affected. Paying more money in order to have the problem fixed just adds insult to injury. Which brings us back to the trenchless sewer repair process. Nu Flow Technologies has developed a trenchless system where we can actually fix the pipes without the need to excavate. With the Nu Drain pipe lining system your yard or grounds will stay perfectly intact during the process. This feature saves property owners from having the expensive landscaping and hardscaping ripped apart. It also saves a tremendous amount of time. 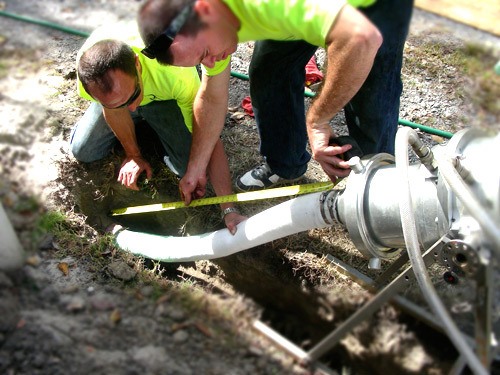 The entire trenchless process can be completed within a day or two. That means anyone residing in or working at your property will be back to normal in the blink of an eye. In order to compare the timeframe, it can take plumbing contractors multiple weeks to complete the sewer repair when using the trenching process. The difference between a day or two and multiple weeks is astonishing, and has a completely positive impact for the property owner. The Nu Drain pipe lining method uses a small access hole to insert an inflatable tube into the sewer pipes. The tube is covered in an epoxy resin that was specially formulated by Nu Flow Technologies. Once the tube is pushed, pulled, and blown into place it is inflated. The intent is to cover the interior surfaces of the broken sewer pipes with the epoxy resin material. The tube is then deflated, which allows the epoxy resin to dry and harden. This is known as being cured in place. When the resin cures in place it forms a hard lining that is also known as a pipe within a pipe. The newly formed pipe eliminates any breaks in the line and problems with the system. When all is said and done the Nu Drain trenchless pipelining system costs the property owner just about half the price of other sewer pipe repair methods.